Desperate times call for desperate measures when Charlie Rogers (Elvis Presley) wrecks his motorcycle and needs to raise the money to fix it. Luckily for Charlie, carnival owner Maggie (Barbara Stanwyck) is willing to give him a shot. She invites him to work for the carnival, offering to replace his guitar — which was also damaged in the wreck — and get his motorcycle fixed, if he puts in hours as a roustabout. Reluctantly, Charlie takes the job. The carnival may become more than just a temporary gig when his eye is caught by Cathy (Joan Freeman), who works at the carnival along with her father (Leif Erickson). 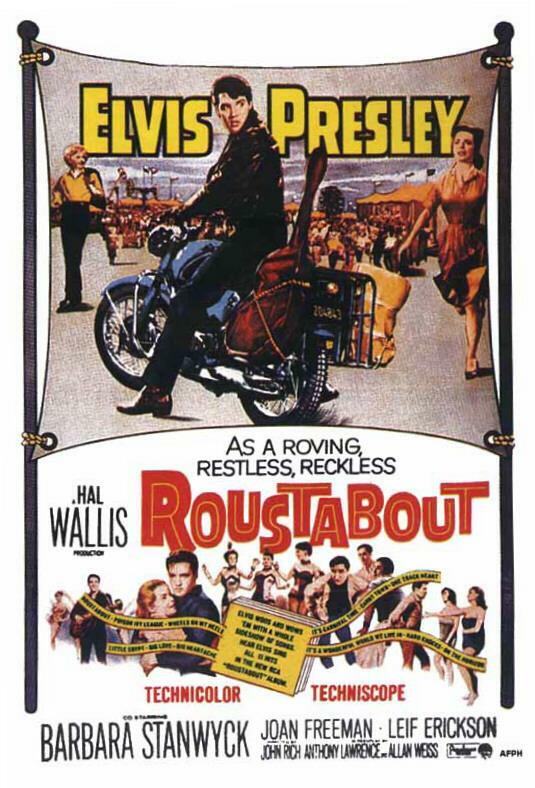 John Rich directs 1964’s Roustabout. Stanwyck and Elvis make an unlikely screen pair! I would be interested to watch this film even if I hadn’t started the Stanwyck project, if for no other reason than to see two icons of different eras share the screen. Stanwyck’s role is one of her usual strong ladies, a hard-working and honest woman who is at risk of losing everything if she can’t make her carnival more profitable. This film is clearly an Elvis vehicle, and as such, Stanwyck isn’t given a ton to do. That said, some of her scenes alongside the megastar singer are the film’s best. In one particular scene, he turns down her offer to permanently join the carnival, because he doesn’t want to become attached to anyone. In response, Stanwyck delivers a great rant. Maggie is willing to work with Charlie but also seems wary of him when they meet. There are many things they don’t see eye-to-eye on, but they end up helping and appreciating each other eventually. As for the one and only Elvis, his performance is not as impressive here as in Love Me Tender (which I watched just before Roustabout), but the film is still enjoyable. While the script is quite thin and doesn’t make the most of its cast, it provides an interesting behind-the-scenes look at a carnival and some of the odd (but not as eccentric as you’d expect) characters who make a living off of it. There’s an interesting use of color here — not as bright as you’d expect for a technicolor film about a carnival, which aligns with the film’s portrayal of the “reality” of the carnival rather than the glamour and fun of it. Barbara and Elvis! I saw the Stanwyck banner, then started reading about an Elvis film and thought, wait, did Lindsey goof? I had no idea these two ever worked together…what next, Stanwyck and Eastwood? Ha, I stand corrected! Nice research…too bad he really isn’t in the episode! How about…Stanwyck and Streisand? Now, those two never worked together (or adjacently) that I know of, but I do remember reading once that Jane Fonda accidentally called Stany “Barbra Streisand” once while presenting an award. Foiled again! You’re good, Lindsey…I congratulate you on your knowledge of everything Stanwyck!